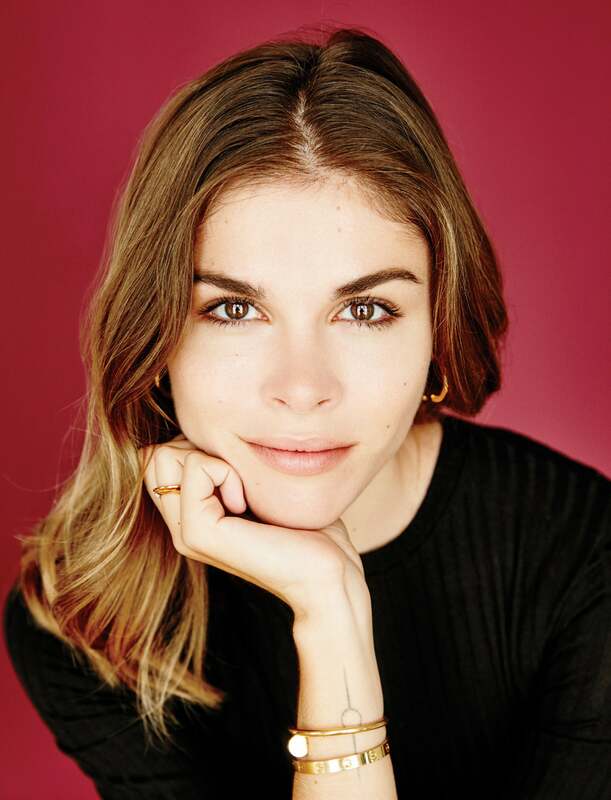 Former blogger Emily Weiss had a hunch: If she could translate women's real needs into products, she could build a beauty company unlike any other. In the elevator, a short woman in her 50s turns to chat her up. “Do you work here?” she asks. On 6, the doors open to reveal Elizabeth’s destination. It’s the Glossier showroom, the brand’s only existing retail space, at least for now. It opened full-time in December of last year -- a floor-through, gut-renovated homage to millennial pink: pink-and-white packaged products arranged on pink lacquered displays, pale-pink-subway-tiled walls, staff dressed in pink mechanics’ jumpsuits, fresh-cut pink and white flowers and flattering lighting. It’s 5 p.m., and the space is buzzing with a few dozen devoted Glossier fans of varying ages, ethnicities and genders. We’re told that Hilary Duff, the actress, has just left. “People really do come here to hang out,” says Brittney Ricca, Glossier’s manager of communications. She means it. Last summer, someone had a pizza delivered here. If it weren’t already obvious, Glossier inspires a kind of devotion and intrigue unmatched in the traditionally fickle beauty space. In less than three years, and with just 24 products that range in price from $12 to $35, the startup has become one of the industry’s biggest disruptors. Weiss won’t share figures but says that revenues are up 600 percent year over year and the brand has tripled its active customer count over the past 12 months. Its flagship now does more sales per square foot than the average Apple Store, with lines out the door and a very impressive 65 percent conversion rate. And last November, Weiss announced on Glossier’s blog that the company had raised $24 million in Series B funding, representing a total $34.4 million in venture capital to date, which will go toward opening additional retail locations, shipping internationally and expanding product categories. In July, the company announced it would begin shipping to France, the U.K. and Canada, with more countries to come. And soon it will move its headquarters to a new, 26,000-square-foot space at the flashy One SoHo Square in New York (where MAC Cosmetics, an Estée Lauder company, also has an office) and add 282 new jobs to its current team of 85, funded in part by a $3 million tax credit from the state of New York. Weiss writes every one of them back. Because she, too, has been waiting for this moment, ever since she had an insight years ago that has since bloomed into a corporate philosophy, and a runaway success. The beauty product industry has thrived on making women feel bad and selling them overpriced products that don’t deliver, but it doesn’t have to be that way. Weiss had a different idea, one as simple as it is revolutionary: Make them feel good. As a teenager, she dabbled in local modeling, did her friends’ makeup for prom and studied fashion and magazines. At 15, she began babysitting for a neighbor who worked for Ralph Lauren, then tested out her budding hustling skills. “I said, ‘I love your kids,’” she recalls, “‘but is it too bold for me to say I’d really like to intern where you work?’” It was not. After spending two summers interning at Ralph Lauren, she enrolled at NYU in 2003. Someone at Ralph Lauren introduced her to Amy Astley, then the editor in chief of Teen Vogue, and Weiss spent her sophomore through senior years cramming her classes into two days so she could spend the other three interning at the magazine. Teen Vogue became her first taste of fame. Fans of the MTV reality show The Hills might recall the time when “co-stars” Lauren Conrad and Whitney Port, ostensibly interns in the magazine’s West Coast office, were pitted against “intern Emily.” While reality shows aren’t the best representation of reality, Weiss’ scripted persona had plenty of truth. She was cast as a type-A New Yorker foil to Conrad and Port’s laid-back Valley girls, a preternaturally poised undergrad who knew how to use the word chinoiserie. And famously (at least among Hills fans), she triumphed: In one episode, Weiss was invited to stay for a fancy dinner that all three interns had helped set up, while Conrad and Port were banished to go eat in their cars. Weiss graduated in 2007 with a degree in studio art, then kept rising in media. She was a fashion assistant at W, then an on-set styling assistant for Vogue, where she routinely pumped the biggest talents in fashion for information. (“I was able to ask these women, What’s that lipstick; what’s the hair?”) She also learned that while most women thought a lot about their own beauty regimens, they rarely talked about them. Weiss wanted to debunk this stigma and erase this shame. To do it, she decided, she’d call upon her magazine training and create a blog. (This, after all, was the era in which blogs were transforming nobodies into style stars.) She sketched out a logo -- a blot of nail polish -- came up with a few regular features, and spent $700 on a camera and a website built by a friend of a friend. She called it Into the Gloss. Into the Gloss launched in September 2010 with a post about fashion publicist Nicky Deam and a banner ad from beauty giant Lancôme. The cosmetics brand had explored partnerships with bloggers but struggled to find one that matched its taste level. Then Weiss spent a week pestering its then-PR director, Kerry Diamond, for a meeting. When Weiss finally got in the door, “she opened up her laptop and, like, unicorns and rainbows and sunshine shot out of it -- just, like, wow,” says Diamond. The writing was cultivated but conversational, light but not silly; the graphic design, sophisticated and inviting; and the photography, beautiful. “It was everything we wanted but didn’t know we needed,” says Diamond. The brand signed on to advertise. Weiss kept her day job and ran her site every morning between 4 and 8. Her audience grew swiftly -- a combination of Weiss’ appeal and the fact that she produced genuinely compelling content that was often far more revealing and smart and personal than your average beauty coverage. Columns like “The Top Shelf,” which she often conducted while sitting on the subject’s bathroom floor, featured insider-y interviews in which supermodels, magazine editors and beauty and fashion execs revealed their daily routines, preferred products and, in a plot twist, quite candid struggles with insecurities (supermodel Karlie Kloss on acne, J. Crew’s then-creative director, Jenna Lyons, on aging and ice cream). Beauty at Into the Gloss became not something that divided women but something that united them, offering a sort of catharsis, companionship and assurance. Which led to her next question: What would help the mission? In 2013, Weiss started approaching venture capitalists with a vague idea about products, or maybe an Into the Gloss-curated e-commerce platform. She told them that for three years, she’d been spending her days in conversations with women who had lots to say about what the big beauty brands weren’t doing for them. Beauty consumers, she said, were overwhelmed by offerings, and brands weren’t helping themselves -- “launching the craziest things that aren’t user-friendly, or don’t really work, or don’t help you replace anything,” says Weiss. The cabinets under women’s sinks, her own included, were full of ziplock bags of stuff they never used. Weiss wanted women to have products that would never let them down or see the inside of a ziplock bag. She was more interested in something being good than being new. But she struggled with what to do next. For one, she didn’t have a clear business plan. For another, she was schlepping all over New York talking to “mostly dads” who couldn’t appreciate the problem, or her simple solution. She didn’t have, as she says, “some huge technological advancement or patent that differentiates my beauty product from another person’s beauty product.” She didn’t even have a product, really. She had a mentality. With Davis’ help, Weiss settled on launching a product line. She believed she could make a better beauty product, with the feedback of her readers. “You don’t need most beauty products,” she says. “They’re an emotional purchase. That’s why the conversations are really important. What choice do you have but to ask your customer what they want?” She partnered with a California-­based chemist to create an initial line of high-quality basics -- essentials that were easy to use and affordable, and encompassed all she’d learned from her readers. For example, a moisturizer that wouldn’t cause breakouts, didn’t interfere with makeup, wasn’t superexpensive, and smelled nice: literally what she’d heard women asking for time and time again. Then there was price. The beauty industry runs on prestige pricing and equates high cost with high quality. That left a space open for Glossier to make a statement with low pricing. “A dirty little secret of the beauty industry is that Chanel No. 5 costs, like, $150, but to actually make the Chanel No. 5 costs, like, nothing,” Weiss says. “Making a bougie, expensive beauty brand wasn’t helping the mission, or very fun for me. We can all be united by that $12 coconut balm. You don’t need to charge an arm and a leg.” The packaging was also designed to inspire conversation. Glossier’s bottles would be Instagram-worthy, with a lot of white space and each purchase came with a sheet of emoji-like stickers -- ­leading consumers to personalize their bottles and then share them on social media. In October 2014, Weiss unveiled the brand’s first four products on her blog, along with a note saying it “is the beginning, I hope, of a new way of looking at beauty.” When Glossier’s site went live at 6 a.m., she and her small team gathered around a single laptop, bleary-eyed from having not gone to sleep and crossed their fingers. They’d offered a first-day promotion in which New Yorkers who ordered before 2 p.m. could select same-day delivery. The response was overwhelming. “There were, like, 12 people working here,” says Weiss. “We were Uber-rushing our first-day deliveries to customers in New York using, like, 30 burner phones. Everyone was doing something that was not their job.” Weiss did a few deliveries herself, which Glossier filmed and put on Instagram. It was chaos. Beautiful chaos. Six weeks after its launch, the company announced $8.4 million in Series A funding led by Thrive Capital. Weiss used the money to invest in technology and data analytics that would study Instagram and other social platforms, measuring not just how well certain Glossier posts performed but how well each product performed: Were people sharing them as product shots, or selfies, or not at all? Which user-generated posts sparked the most engagement, and how much more engaged could they be? For an entrepreneur who had recently struggled to impress investors without a new technology, Weiss was hitting upon something at once obvious and revolutionary. Her customers lived on social, and her products are visual by design, which meant that, with the right tools in place, sites like Instagram could become Glossier’s R&D lab and marketing platform. So first, she ensured that customers would feel heard on Instagram -- having her marketing, editorial and customer service teams take turns responding to all comments publicly or by direct message. (This still happens today.) And then, critically, the company began using Instagram to build mini focus groups and quickly create products based on what they learn. One post in February 2016, for example, asked followers what they wanted most in a heavy-duty moisturizer. More than 1,000 people responded; the company took that feedback and used it to build a product called Priming Moisturizer Rich, which it released in January. This has become the way Glossier now talks with its consumer. It asks, it listens and it churns out a new product every six to eight weeks -- “enough time to get it, use it, shoot it, talk about it and then you have another one,” Weiss says. And this approach has led to furious brand loyalty. Weiss says that 70 percent of online sales and traffic comes through peer-to-peer referrals, a number that’s remained constant. Now Glossier is constantly experimenting with how to harness the power of that community to even greater strength. Earlier this year, for example, it launched a program in which more than 420 of its most active and influential community members sell products to their friends and followers; in turn, they receive a cut of the profits, as well as rewards that include sneak previews of products and trips to New York to visit Glossier and have dinner with Weiss. By summer, the program had helped generate 7 percent of the brand’s annual revenue. A story: One day in late 2014, Emily Weiss was riding the subway when a woman introduced herself. “She came up to me and said, ‘I just love Glossier,’” says Weiss. Weiss asked what the woman did for work. “She said, ‘I just graduated college, and I don’t have a job.’” As it happened, Weiss was in the market for an assistant. “Come in and interview,” she said. The woman did, and she got the job. But then that’s the nature of building an inclusive company. When you listen to everyone, you’ll find they all have something valuable to say.